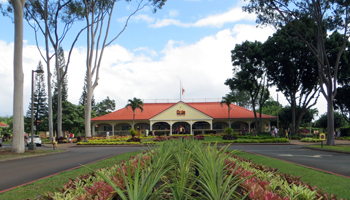 Dole Pineapple Plantation Remembers when Pineapple was Hawaii’s Crown. A Modern Look at Hawaii History! The Dole Pineapple Plantation in Wahiawa actually started as a roadside fruit stand back in 1950. It has grown up quite a bit since then; and honestly, it’s a quintessential tourist trap! 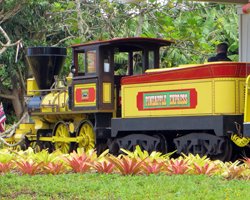 Constructed, ostensibly, as a tribute to Hawaii’s agricultural past, it’s essentially a Hawaii attraction designed to herd visitors in by the busload! To get there, just follow Kamehameha Highway going north out of Wahiawa and look for it on your right. You can’t miss it. The Dole Pineapple Plantation at Helemano is just about the only structure in the middle of what used to be Oahu’s endless pineapple fields. Parking is free and plentiful (which is good, because that place gets packed). Remember those Hawaiian snacks I mentioned above? 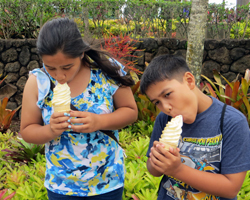 Of course the Dole Pineapple Plantation has real Hawaii pineapples and various island style treats; but the best of these is the pineapple Dole Whip/vanilla soft serve twirl cones (like they sell outside the Enchanted Tiki Room at Disneyland, if you’re familiar with that). These are not free, but they’re definitely worth the stop! My family makes me pull in for twirl cones almost every time we drive past. Furthermore, many of their souvenir snacks are quite good, and they often have free samples. Try the nuts, they’re delicious. But I’m warning you… it’s easy to get carried away with all the tasty temptations. If you still have any money left over after loading up on snacks, you can run through what is advertised to be the world’s largest garden hedge maze (shaped like a pineapple, of course). 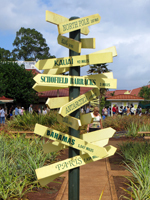 Covering 3 acres with 4 km (2.5 miles) of paths, the Dole Plantation maze is a truly unique Hawaii attraction. It’s also cheap ($6/adult and $4/child) and easy. So unless you have giant hedge mazes everywhere near you, I’d say you might as well give it a go. If nothing else, it gives you bragging rights! 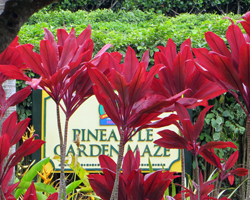 For another small fee ($5/adult and $4.25/child) you can take a self-guided plantation garden tour. 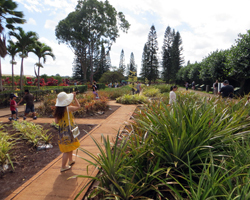 Stroll through eight different gardens and discover the various plants that have been important to the people of Hawaii throughout the island’s history. 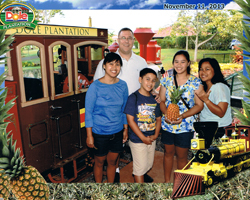 Finally, you can also pay ($8.50/adult and $6.50/child) for a ride on the Pineapple Express – a narrated train ride that takes you on a round-trip route of more than 3 km (2 miles) past the plantation garden and out into the once-great Wahiawa pineapple fields. 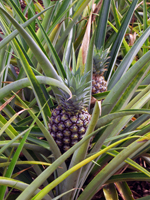 During this 20-minute excursion, you’ll hear the history of pineapples in Hawaii and enjoy some beautiful scenic Hawaii sightseeing along the way. Basically, you’ll probably learn more about Hawaiian history from your ride on the Pineapple Express than from anything else at the Dole Pineapple Plantation. There are two trains in operation. The yellow one makes for more attractive photos, but the passenger cars on the red train have a more elegant finish, including wood-paneling. I just took my family on this Hawaii vacation activity for the first time recently, and we had what was probably the best possible experience. Our train (the red one) derailed three-fourths of the way through the circuit. That almost never happens (and there was never any hint of danger). So as a result, the yellow train had to come take us back to the station. We were able to ride both trains for only one fare! Then to apologize for the so-called “inconvenience” (which I think most everybody enjoyed), they gave us our souvenir photos for free! I probably wouldn’t have even considered paying for the photo. But after seeing the quality of it and all that was included, I think we would have regretted not getting it. 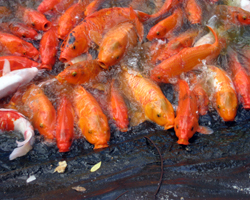 If you want to do more than one of these activities, they have package pricing available. Basically, it’s just up to you how much time and money you want to spend. 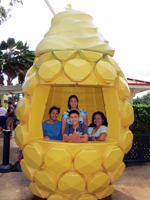 Like I mentioned above, the Dole Pineapple Plantation is practically a pineapple theme-park; and as such, it would probably be a fun Hawaii activity for any family vacation in Hawaii. Older family members get an iconic island experience, and your children get food, rides and games. I get Dole whips! Everybody’s happy. If you know you’ll be doing the paid activities, you might want to consider getting some extra value by consolidating expenses with a Go Oahu Card: Shop now and save up to 55% off Oahu's top tours and attractions! . You can use this card for the maze and the train. Then continue down the road to the north and east shores and use it for entry to Waimea Valley, Polynesian Cultural Center, the Kualoa Ranch Movie Site Tour, jungle tour, catamaran tour, and more (link opens a new window/tab)! One final note: if you’re going to be out there, you’ll be just down the road from a truly important Hawaii historic site: the ancient Hawaiian Kukaniloko Birthing Stones. As long as it’s not raining, you should see those while you’re in the area. They're just a quick stop.